The event will be Friday – March 22 – from 11 a.m. to 3 p.m. at the Charleston Coliseum and Convention Center. 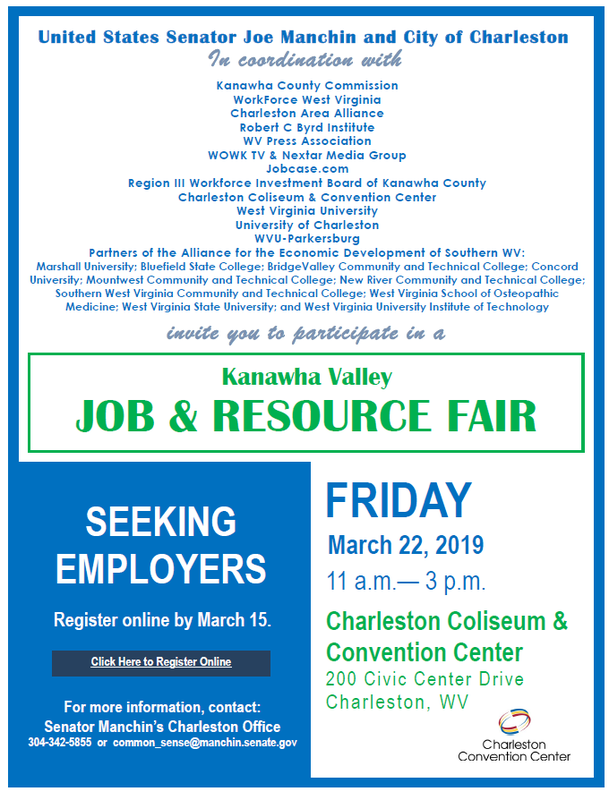 “Please join us for this exciting event as we bring together employers and job seekers from across West Virginia. 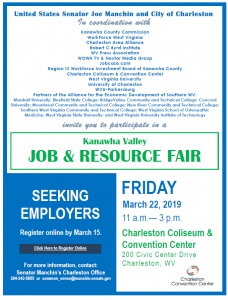 Additional hosting partners include the West Virginia Press Association, Robert C. Byrd Institute (RCBI), WorkForce West Virginia, Region 3 Workforce, WOWK-TV, JobCase.com, the Charleston Area Alliance, the Alliance for the Economic Development of Southern West Virginia and many others,” an organizer said. Organizers are encouraging businesses and organizations to register as an exhibitor at the job fair. There is no cost to participate and lunch will be provided. Exhibitor setup will begin at 9:30 a.m.
“If you have questions or need additional information, please contact Jane Bostic with the City of Charleston at jane.bostic@cityofcharleston.org or Senator Manchin’s office at common_sense@manchin.senate.org or 304-342-5855,” organizers said.